About two weeks ago, Robotpencil alerted his watchers on DeviantART that Robot Unicorn Attack Evolution was released. You’ll probably recognize his work from several months back , which is the splash screen for the game’s title screen. Now about the game. It sports clean, updated graphics and the ability to play as a Panda, a Wolf, a Gorilla, and a Dragon. You unlock them as you destroy stars. So now the game feels like it has a goal (which is to get to the Dragon). You can also unlock abilities like an extra jump, gliding, and a steadier pace. 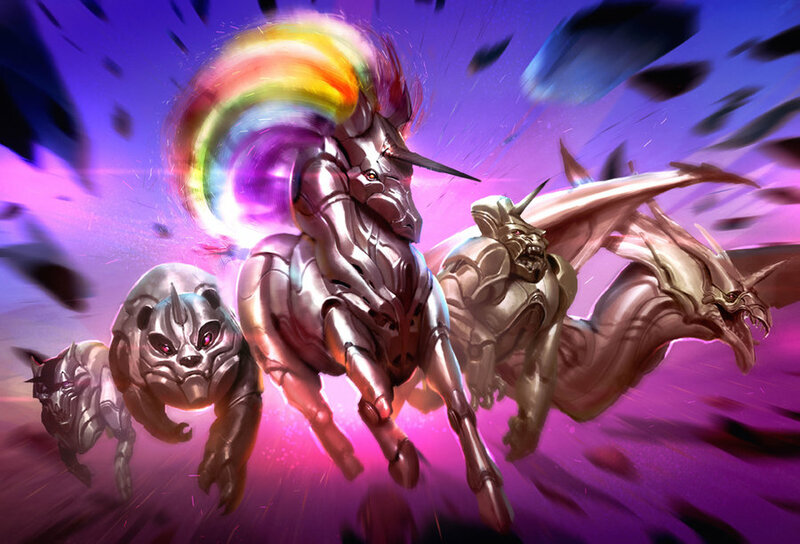 For now you can only play Robot Unicorn Attack Evolution on Facebook. No word yet if Adult Swim will have it playable on their site. This entry was posted in Gaming News and tagged Adult Swim, harmony harmony oh love, i look in you eyes I see your eyes are open, robot unicorn attack, robot unicorn attack evolution, robotpencil, rua on February 14, 2012 by Steven T..